As I look at the determined faces of the veterans marching in front of me on Memorial Day, I am in awe of their quiet dignity. Solemn and sad-eyed, they are the survivors of battles fought, and comrades lost. Some of them are stoic and steely while others crack jokes, full of mischief. Watching them march on Mott Street, I think of a boy in Chinatown who grew up watching them too. He must have admired their straight lines and precision, the undeniably upright way they held their heads as they stepped smartly down the street. He must have felt intense pride at the sight of these stately servicemen, daydreaming of the moment he could join them. 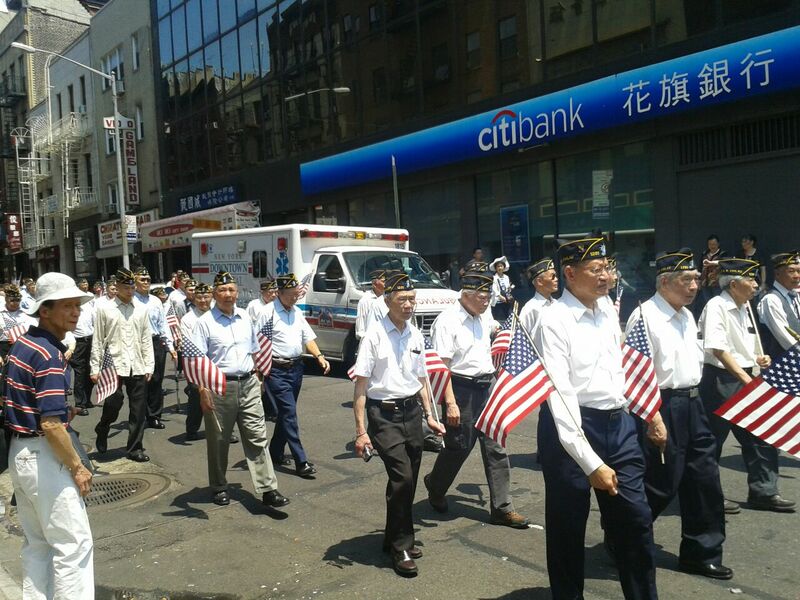 Veterans march on Mott Street during the 2012 Memorial Day parade. Danny Chen spent the first 10 years of his life growing up in Chinatown, the only son of immigrant parents. His mother, Su Zhen Chen, was a seamstress; his father, Yan Tao, worked as a chef. According to a January 6th, 2012 article in New York Magazine, Chen later moved with his parents to a housing project on Avenue D and attended Pace High School, where he excelled at math. He loved to play video games and dreamed of joining the NYPD. His mother wanted him to go to college, but Chen felt drawn to the military, and hoped to become a better man in its ranks. At first Pvt. Chen wrote humorously of being the only Asian-American in his unit. He stayed upbeat and strong through the name-calling, the stupid questions, the teasing. In time, these immature remarks escalated into full-blown bullying, racist taunts, and brutal physical punishments. On October 3rd, 2011, Chen was forced to crawl across 100 meters of gravel carrying heavy equipment in the blazing sun, while his superiors threw rocks at him, hurling insults and ethnic slurs. Within hours, the 19-year-old was discovered dead in the guard tower, from a self-inflicted gunshot wound. What happened to Pvt. Danny Chen in Afghanistan is every parent’s worst nightmare. And as it turns out, he was not alone. Just six months earlier, on April 3rd, 2011, 21-year-old Lance Cpl. Harry Lew had killed himself after a vicious beating and hazing in Afghanistan. A native of Santa Clara, California, Lew was the nephew of U.S. Rep. Judy Chu, the first Chinese-American woman elected to Congress. Since his death, Chu has worked tirelessly for justice and reform on her nephew’s behalf. Three Marines were court-martialed in the Lew case. Eight soldiers were charged in connection with Chen’s death; all are facing varying charges of maltreatment, assault, battery, reckless endangerment, involuntary manslaughter, and negligent homicide. Last Thursday, over 300 guests gathered in the auditorium of Pace High School to celebrate what would have been Pvt. Danny Chen’s 20th birthday on May 26th. In the crowd were the faces of his parents, his grandmother, and many relatives, friends, activists, artists, and supporters in the Chinatown community. They had come to remember his short life with songs, tributes, and cupcakes. I thought of how Pvt. Danny Chen would never get to celebrate another birthday, distinguish himself in battle or march alongside his elders and peers in any Memorial Day parades. I remembered that Danny Chen joined the Army because he had wanted to make a difference in the world, and I realized that he already has. Last week, over 9,000 cards were sent to Congress in honor of Pvt. Danny Chen’s birthday, urging passage of H.R. 5638, or the “Service Member Anti-Hazing Act.” The bill passed the House on Friday; it’s now awaiting approval from the Senate. First there are the crowds, jostling and pushing, stopping suddenly to take a picture, tapping impatiently with a cane, and tripping you with tiny, child feet. The streets are full of the humming of humanity. During tourist season, it can take almost an hour to walk from the subway stations on Canal Street to the bustling businesses on Bayard. Parades, which happen pretty frequently around here, are spontaneous carnival beasts. You’ll get an inkling of one when police barricades mysteriously appear at the curbs of Mott or Mulberry. There are the glorious, fiery dragons of Chinese New Year, the endless, cheery yellow procession of Falun Dafa devotees, and the East Meets West flotilla of Chinese-American and Italian-American citizens waving on floats through Chinatown and Little Italy. One minute you’re sitting on the couch watching television or reading a novel. The next minute finds you freezing on the fire escape, with a coat pulled over your nightie, at the first sound of drums. This is followed by cheers, and sometimes firecrackers or the Crimson Kings, Chinatown’s very own youth marching band and drum, fife, and bugle corps. Yesterday was no exception to the “parades will happen when they happen” rule. Stepping downstairs, I was greeted by the sight of monks in saffron robes, exquisitely adorned flower bearers, giant golden lanterns, and a phalanx of middle-aged scarf dancers whose precise flicks of the wrist foiled every click from my camera. 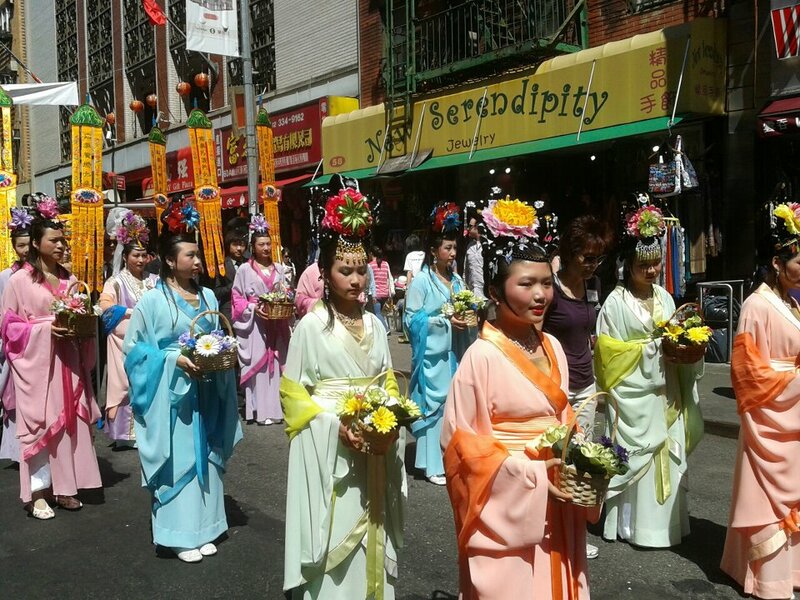 The beauty and pageantry of yesterday’s parade was stunning, even by Chinatown’s colorful, noisy standards. 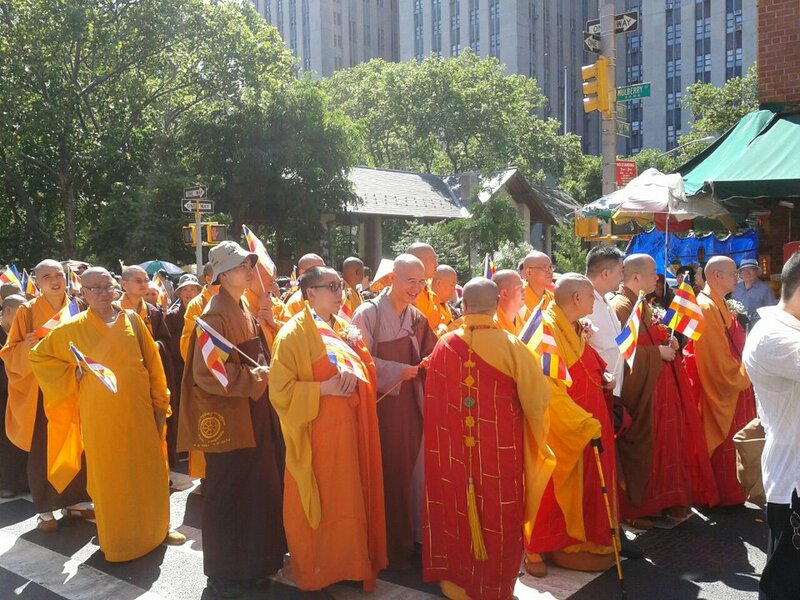 With the sun shining above, and the brilliant hues of saffron and fuschia billowing against the dingy, dirty gray of the streets, it was easy to believe that Buddha’s birthday was waiting expectantly around the corner, and that it would usher in a time of greater compassion, illumination, and peace. This momentous day marks another grand occasion: the birthday of my paternal grandfather, Don Moy, who would have turned 99 today. It’s both fitting and auspicious that I dedicate this first blog post to him.